Another weekend, another Facebook Timeline filled with pictures of people I used to know getting married. 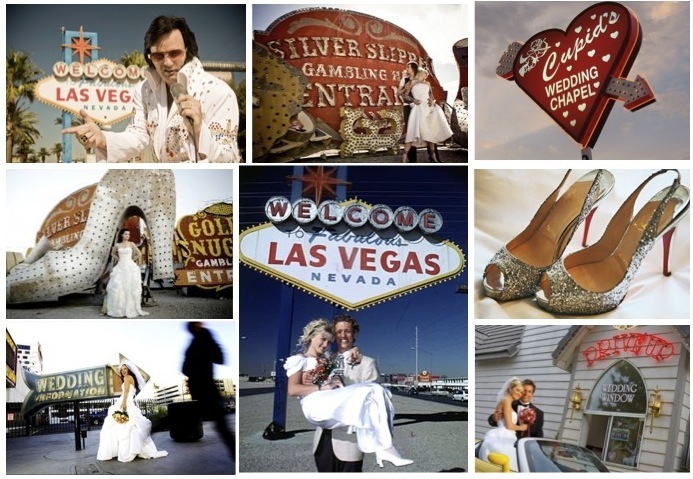 Actually, the more I see, the more I think a Las Vegas wedding may be the way to go for me. And no, I'm not taking about getting married by an Elvis impersonator at a drive-through, but I am talking about something fun and irreverent. The sassy Parker dress above, available in white and bronze, would be the perfect look for a bride or a guest to celebrate taking a gamble on marriage by dancing on a table or two. What do you think, Vegas or bust? Beautiful images, I love the the short white dress, so hot. Love the dresses and the accessories you paired it with. Ohhhh I'm loving the shade of taupe fabric in the guest style! So chic! Love it, I think that get married in Las Vegas is so fresh and fun maybe be a cool place to do it with no pressures and in a rush! I love Parker - Such great dresses! Seeing all the stress that goes in to planning a wedding, I often think Vegas may be the way to go! I LOVE Parker dresses! Everything about this is perfect. While I love to look at pinspirational images of big weddings, I just can't imagine spending all that money for one day. I WANT that dress. Love both the bride and guest outfits! Vegas! I got married in a small ceremony with no party and just a few relatives. The most important is that you marry a man that you love with all your heart, not the big fat wedding with years of planning. I love this! I'd totally go vegas. But just because i'm obsessed with the idea of a short dress for a wedding. Especially the idea of a bronze color too! Heyy i want have wedding in Vegas :D Love it. I would love it if we could follow each other? À Vegas wedding would be fabulous! Love both dresses! Loving the sparkly guest dress! I love the bride look! Lovely post!!! The dresses are so perfect!!! Bride or not, the white one is perfect for a party night!!! Tks to visit my blog! I will following you! Nice blog and post! I like the first kind of dress! :) I liked your blog! Please, if you also like mine... we can follow each other, so we will be able to see our recently updates! Just follow me and I'll follow you back! ;) I swear! I really like your blog. Im allready follow you. So original! I love this post. That white sequin dress is the ultimate vegas wedding gown. Great style! Looks like fun for a vegas wed! Great outfits for a vegas wedding! Follow me if you like my blog and I''ll follow you back. WOW! Love that bride dress! great post and so inspiring blog! Either way I am sure you can't go wrong doll! vegas style dressing is the best! Love those sparkly little dresses....makes me want to get married again...haha! Love a bride in a short dress! This one is stunning! had no idea the dress came in white too! loooved it soo much and can't wait to wear it again!